During this month you will realize you need stillness and calm but it's not always easy to get it. The previous weeks have been crazy and you need to slow down, but you have to keep going out every once in a while. You will spend more time with your friends and will be more receptive to what they say when they want to share an opinion. You may go out and party. Mercury will help you give media coverage to one of your projects. Listen to your friends and use your team spirit. You have nomore options at work but you aren't scared of it. It will even boost you. Indeed Mars in first house will make you bold. With Neptune in dissonance you can't really be lucid. You are confused and frequently daydream. Ask your family for advice. Saturn in harmony will help you set the record straight in order for you to climb the social ladder and plan in the long term. During the week of 7, good aspects of Mercury will give you some confidence in order to communicate and defend your point of view. Stay simple as far as your business. Good aspects of Venus to your sun in the week of 7 may favor encounters, hugs and gifts. If you're in a relationship, your partner will give in to your charm. 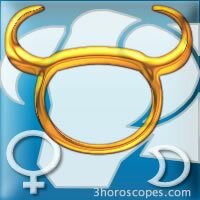 Taurus, do you know your zodiac sign ?